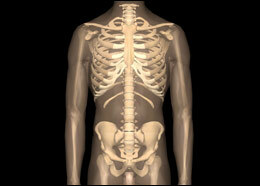 Even healthy people may suffer from back pain. If one realizes that the lumbar spine resting just above the pelvis holds all of the weight of the head, arms, and trunk and that, despite that heavy load, we still require that it be able to bend and twist, it is amazing that there is anybody at all who does not suffer from back pain. Each of the vertebrae that make up the spine behaves like a tripod with a thick front leg resting on the disk that separates and cushions the bones in the spine and two smaller hind legs that join similar protrusions from bones above and below it. All of that is held in place by a complex system of ligaments and some of the strongest muscles in the body. Close attention needs to be paid to the correct spinal alignment when exercising since any deviation from the right position will be magnified by the effects of gravity or the use of weights. While a torn muscle usually heals nicely, a disk tear never heals and often remains a source of intermittently severe pain for years. Since it is so ubiquitous, many people choose not to seek medical help for their lower back problems, but any pain that radiates to the lower extremity (or the upper extremity when it is the neck that is involved) indicates a possible nerve compromise and needs attention from a health care professional. 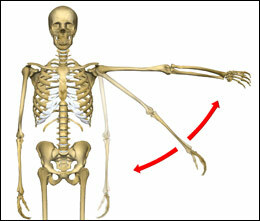 A bit of trivia for those not familiar with the anatomy of the shoulder: it barely qualifies as a joint. If you put a tennis ball on the open palm of your hand you get a good approximation of what the joint looks like, a structure held in place due only to the strong, specialized ligaments and tendons that surround it. The same construction that gives the shoulder the ability to move in such a wide range of directions is also its downfall, making it rather unstable and prone to injuries, dislocations, and inflammation. Due to biomechanical constraints, the unit that comprises the shoulder joint, including the ligaments that hold it in place and the muscles that allow it to move, works best and safest when one refrains from reaching the extreme ranges while performing exercises. For example, lifting one's arms sideways beyond ninety degrees, while holding weights, doesn't add much to the workout but it greatly increases the chances for damage; the same occurs when allowing the arms and elbows to reach too far back while using a butterfly machine. As a rule, the farther in any direction the elbows are from the trunk, the bigger the chances that injuries will occur to the shoulder; furthermore these chances increase exponentially as heavier weights are used while exercising. Because of the leverage effect from even small weights held away from the body, an action apparently as simple as a reaching back to pick a briefcase from the backseat of a car could damage some of the ligaments and tendons that sustain the shoulder, possibly causing a tear to the structure we call rotator cuff. The knees are wonderful, sturdy joints that allow us to run, climb, and kick, but the knees also have a dark side for they contain a self-destructive mode: it's called twisting. The mechanism is comparable to what occurs to two pieces of metal joined by a single droplet of superglue; despite a formidable resistance to pulling forces, they can easily be separated by twisting them apart. 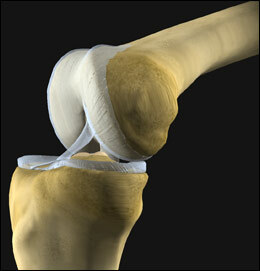 The upper and the lower halves of the knees are held in place not by glue, but by strands of connective tissue: ligaments that run in a criss-cross fashion. Although the knees are strong enough to tolerate years of severe daily beatings from a jogger, it takes only an instant for a foot stuck in a hole and a twisting motion of the body for the ligaments to snap. Good shoes and a flat surface go a long way in preventing injuries. Keep both feet on the ground when the exercise allows for it. Avoid the excessive stress that may result from exercising with the knees bent beyond ninety degrees, as it adds very little to the exercise and greatly increases the possibility of damage. Exercise cautiously, if at all, when the knee hurts, or if it is red or swollen.